As you probably know, a couple of weeks ago JumpeyeComponents launched SlideshowBox, a collection of 24 stylish photo slideshow templates. We wanted to make these templates appealing to both Flash and non-Flash developers, so they could be used on any platform. a Flash component which can be installed in Adobe Flash CS3/CS4/CS5. 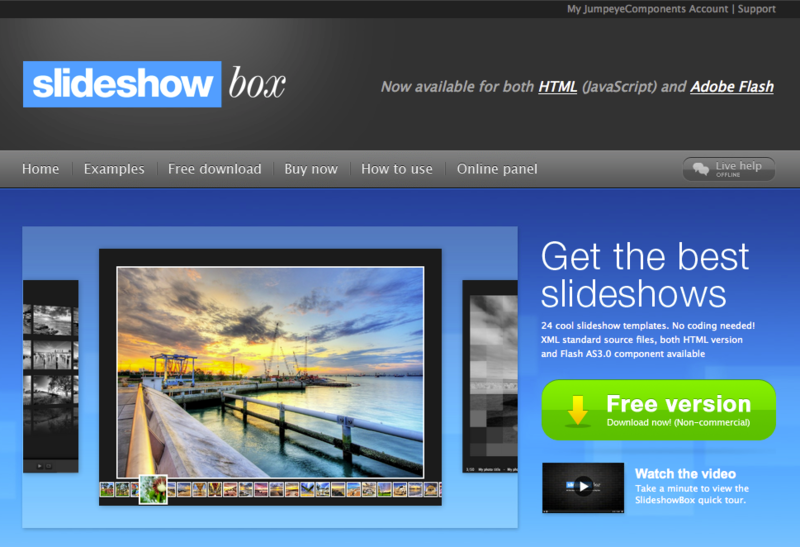 The Flash version of SlideshowBox works with standard XML files containing each image’s title, URL and description. For more information on the Flash component, click here. The “Auto-detect” option will eliminate all the error messages or missing plug-in messages and I think this is something interesting for developers who want to target the Apple users. This entry was posted on Tuesday, June 22nd, 2010 at 10:56 am	and is filed under News, Reviews. You can follow any responses to this entry through the RSS 2.0 feed. You can leave a response, or trackback from your own site. as well happy to share my experience here with colleagues.